4.4.5. f) A safety wire with a minimum diameter of 0,5 mm must be attached between the control system and the engine(s). The engine(s) must always stay connected to the lines. bellcrank bolt (axle) and the engine(s) so as to withstand a minimum pull load of 100 N.
In the good old diesel days this rule made sense. Sinse then the model design has changed a lot. In a modern combat model the bellcrank is typical mounted on a alu rod through the centre section. To comply with the "bolt" rules the safety wire had to be connected to the alu rod. the bellcrank can become disconnected from the alu rod and bellcrank is broken. 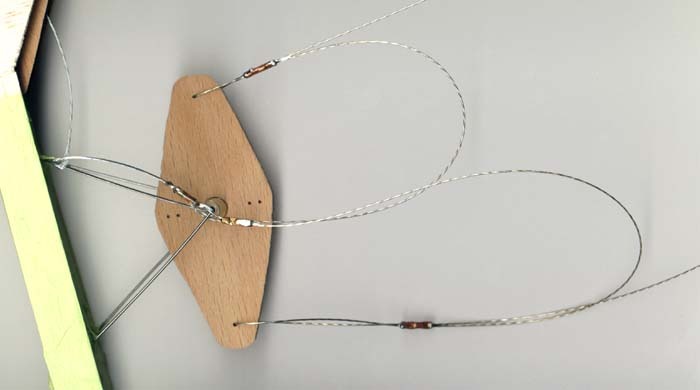 When a centre section is damaged in a collision the safety wire or the bellcrank can become disconnected from of the alu rod and there is no longer a connection from the pilot to the engine. If the bellcrank breaks there is also a high risk that the leadout wires will be pulled out of the wing and the model is free to fly-away. After the implementation of the shut-off rule the bellcrank is now often part of the shut-off system and it can be difficult to decide how the safety wire should be connected to system to fullfill the "bolt" rule. In the proposal for the new rule it is not stated how the safety wire should be mounted but rather what the function of the safety wire should be. The engine must always stay connected to the lines! Even if the lines are cut in a mid air collision a part of the lines must be connected to the model and engine. The idea behind this rule is to encourage pilots and model manufacturers to design control systems and models that do not separate in a crash. 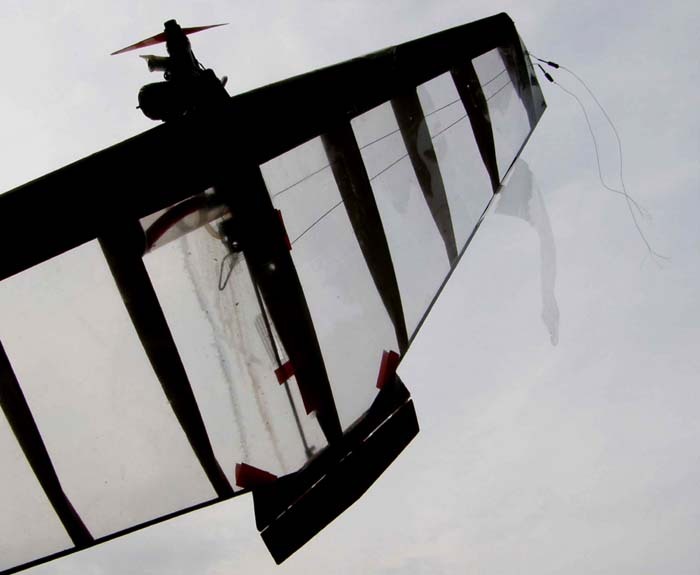 The connection between the engine and the lines must be designed to withstand midair collisions, crash landing and engines that vibrate loose from the engine mountings. This fly-away model is still connected to the lines and should not have a DQ (if the shut-off is working). It will still be possible to use the exciting model design without any changes but it would be an advantage to change the construction to a more robust design. This would minimise the risk of a DQ from the new rule and it will make combat safer for all of us. 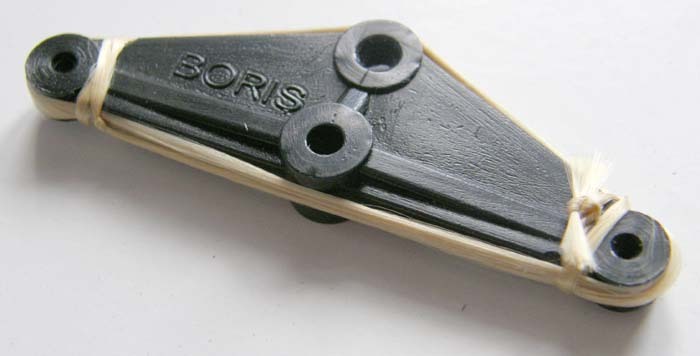 If you are not using a moving bellcrak shut-off on a classic model the alu rod can be replaced with a bolt. 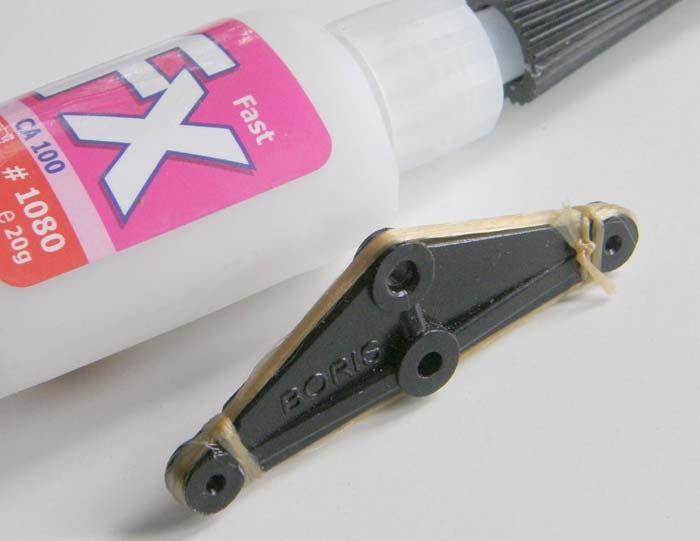 In this comment to the 2008 Clarificatons you can see how to replace the alu rod with a bolt. 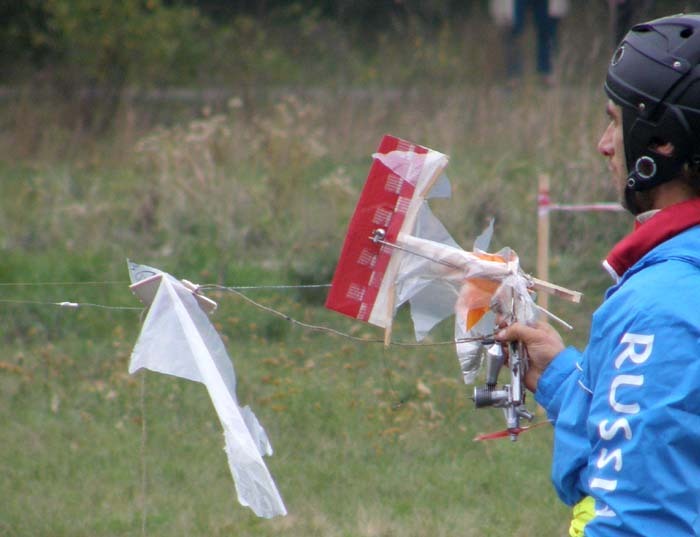 The plastic bellcranck do often break in a mid air collision. Bellcranck with a simple kevlar "safety wire"
connected to the belcrank bolt even if the belcrank breaks. 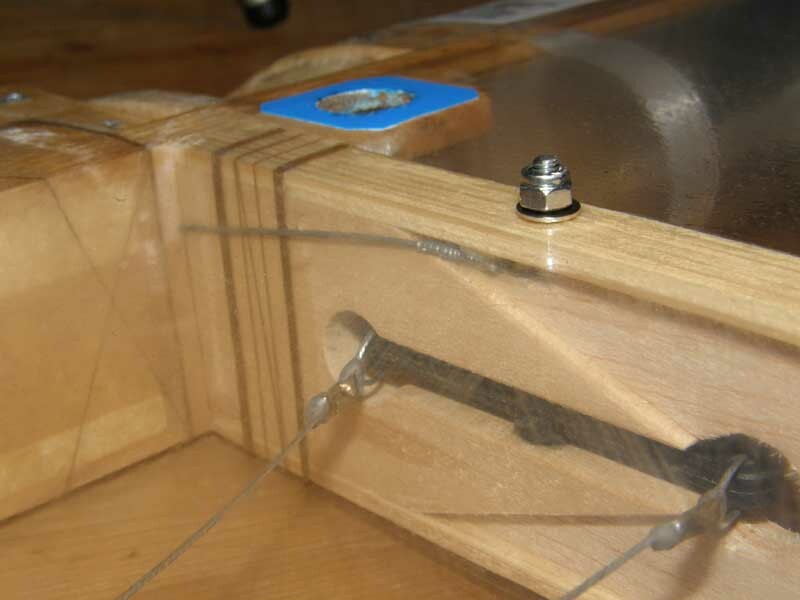 Another way to secure the bellcrank is to make the leadout wires with a extra loop that connects the leadout wire directly to the safety wire. The leadout is here connected directly to the safety wire. 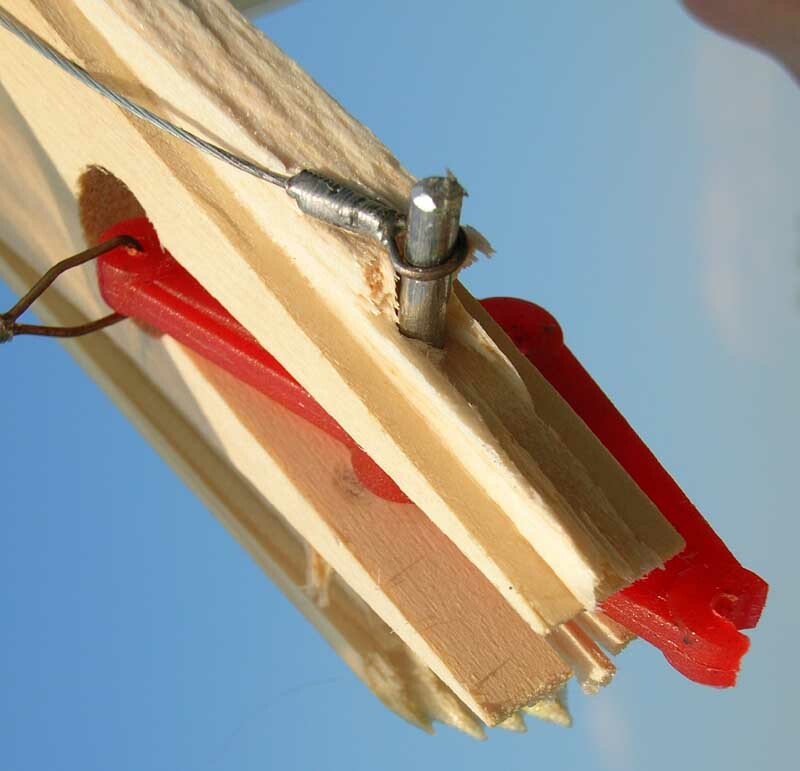 This is a wooden pull-pull bellcrank mounted in a model with piano wire.